Following the victory of Jair Bolsonaro in Sunday’s Brazilian election, events have suggested that the consequences of the far-right politician’s rise to power will reach far beyond Latin America. Indeed, the Middle East is set to feel the effects of Bolsonaro’s rise to power directly, as his administration will continue the trend of the normalization of the state of Israel — whose current government exhibits dramatic parallels with Bolsonaro, courtesy of their mutual promotion of ethno-nationalism and arguably ethno-fascism. Over the course of his controversial campaign, Bolsonaro lavished praise upon Israel on numerous occasions, making it no secret that he is a great admirer of Israel’s current ruling party, Likud, and Israel’s current prime minister, Benjamin Netanyahu. In August, Bolsonaro announced that – if elected President – he would close the Palestinian Embassy in Brasilia, cut off relations with Palestine completely, and move the Brazilian Embassy from Tel Aviv to Jerusalem. “I am confident that your election will lead to a great friendship between the two peoples and to the strengthening of ties between Brazil and Israel,” while also extending an invitation for Bolsonaro to visit Israel. A senior Israeli diplomat, quoted by Israeli newspaper Haaretz, stated that – with Bolsonaro in charge – “Brazil will now be colored in blue and white,” referring to the colors of Israel’s flag. Soon after, Brazilian media reported that Netanyahu would most likely attend Bolsonaro’s inauguration on January 1, which would make Netanyahu the first Israeli prime minister to ever visit Latin America’s largest country. In another case, in 2016, Bolsonaro was baptized by a Brazilian Pentecostal preacher in the Jordan River during a trip to Israel, which Bolsonaro heavily promoted during his campaign to court Brazil’s Jewish and evangelical communities. 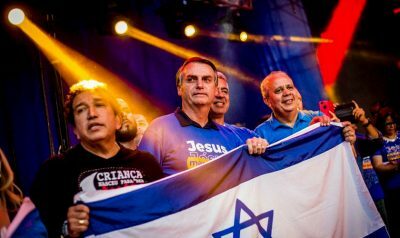 However, some Jews – including Israelis who are fierce critics of Bolsonaro despite his unabashed support for the Jewish state – have accused Bolsonaro of using the trip and the footage of his baptism to court the large evangelical Christian community in Brazil as opposed to Brazil’s Jewish community. Notably, the recent Brazilian election fractured Brazil’s Jewish community, as many Jews in the country protested against Bolsonaro despite his efforts to court them. Such division in Brazil’s Jewish community regarding Bolsonaro may relate to some of the inconsistencies that have arisen as a result of Bolsonaro’s heavy praise for Netanyahu. For example, while Bolsonaro campaigned heavily as a “swamp drainer” and as an antidote to the corruption scandals that have engulfed Brazil in recent years, the Israeli prime minister, as well as his wife Sara Netanyahu, are currently embroiled in massive corruption scandals that have threatened their popularity within Israel. Another apparent paradox in the Netanyahu-Bolsonaro relationship is the fact that, as previously mentioned, a considerable number of Israelis have heaped criticism upon Bolsonaro — with groups like “Jews Against Bolsonaro” including Israelis as prominent members, and prominent Israeli newspapers comparing Bolsonaro to Adolf Hitler. Given the high-profile comparisons of Bolsonaro to Hitler within Israel, Netanyahu’s praise of Bolsonaro may seem strange and striking to some. However, Netanyahu and other right-wing Israeli politicians have often supported ethno-nationalists abroad, while Likud party politics itself revolves around ethno-nationalism, which has often translated into apartheid policies. The support has gone both ways, as European and American ethno-nationalists in recent years have combined anti-Semitic rhetoric with fervent support for Israel’s apartheid policies and efforts to fortify its status as an exclusively Jewish ethnostate. Bolsonaro, with his calls to “cleanse” Brazil of “undesirable” minority ethnicities and other groups, is just the latest far-right, ethno-supremacist politician to receive a warm welcome from Netanyahu and the Zionist apartheid apparatus. Yet Bolsonaro’s pledge to forge close ties to Israel may face some unexpected obstacles. For instance, Brazilian media reports have noted that Bolsonaro’s pledges to cut off relations with Palestine and move the Brazilian embassy in Israel to Jerusalem are expected to jeopardize the market for Brazilian meat that Brazil has cultivated in Muslim-majority nations in the Middle East. According to the influential Brazilian newspaper Folha, more than 40 percent of poultry and beef produced in Brazil is halal and thus can be consumed by practitioners of Islam. Experts and analysts quoted by Folha have warned that Bolsonaro’s expected Israel policy threatens to “annihilate” this key market for Brazilian meat producers. This concern could manifest as a major hurdle for Bolsonaro’s planned Israel policy, given that the meat lobby in Brazil – which includes the world’s largest meat producer, JBS – is extremely influential in Brazilian politics and will likely act to protect such a lucrative market.